As of 10:30 p.m., most forecasters had adjusted their predicted snowfall totals a little higher. KARE continues to stand out from the rest with the prediction of 1-3 inches. The majority of forecasters are now predicting 4-7 inches of snow. It seems that we may have a situation on our hands. In what seems to be a fast-evolving storm scenario, some local weathercasters are scurrying to up their forecast snow totals in light of new data. 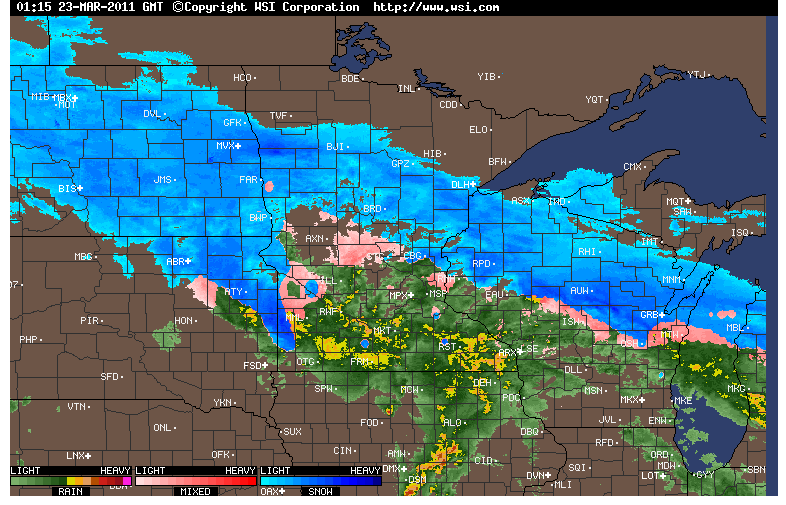 A mighty colorful late winter/early spring radar looks like a work of art. Follow us on Facebook and Twitter to receive updates on the changing forecasts as they come straight from the forecasters' mouths. Might need to take total precipitation estimates into consideration when scoring this storm; straight snow amounts might not be a true representation of how good predictions were. Truth is, the temps look to be within a few 1-3 degrees of the forecast and actual liquid precipitation looks to land right where they all said it would. What we have here is March at its finest. It appears that the latest 18z model runs are attempting to factor in convective snow along with dynamic cooling late this evening into tomorrow AM. Often in these scenarios the models can over-estimate, however, in a convective situation, anything can happen. One thing appears obvious and that is that the heavy snow band has shifted a good 50 to 100 miles further south than expected. If rain quickly changes over to snow in the metro by midnight, then go with higher amounts. If the change-over doesn't fully take place until sunrise, then be conservative. I know that sounds logical at this point, but that's the best I've got. Truthfully, I'm throwing up the surrender flag at this point and just sitting back in anticipation like everyone else. This is really a fun storm to watch evolve. What is your thought about the t-storms in southern minnesota? This is radar from wunderground.com, if anyone is curious. You can make a zoom box by clicking on the screen. Too cold for those storms to offer anything but a few claps and small hail; however, if those t-storms change to snow before they get to the Cities, we'll be looking at very heavy snowfall rates overnight and a huge mess tomorrow as people wake up to a snowstorm they didn't expect. Up here in cedar it's raining straight ice, and very very hard. My driveway has about a half inch of solid ice and the sleet hurts when it pelts your head. 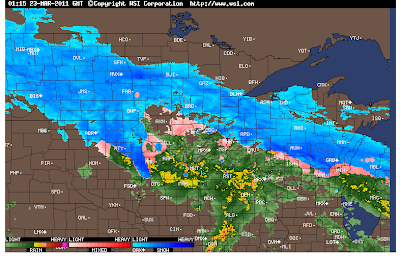 The radar seems to show the rain/snow line much farther south than originally touted. From my view, it looks like it is snowing in Mankato which was only supposed to get rain/TStorms tonight. Wow, the temp dropped nearly a half degree in the last 10 minutes after being stuck for hours. It's a changin'. sleet in Lake Minnetonka area. In Red Wing we are getting hammered with very heavy ice. Sleet is with it along with thunder and lightning. Even saw a flake or two mixed in, but nothing much. Rain is always mixed in. Well, really, it would be a lot easier to just say what ISN'T falling, because right now it's just a mixbag. And it's coming down heavy. A lot of rain mixed with sleet in Carver Co. Been holding at 34-35 degrees since early evening. @ 9:30 pm in Inver Grove Heights - Sleet and has been sleeting for about a 1/2 hour, 32.7 degrees. The Winter Storm Warning has been extended to include Hennepin and Ramsey counties. Wright, Carver, Scott, Dakota still not in it. Kind of surprised the warning hasn't been extended to include the entire NW metro and out toward Litchfield. Maybe they expect the moisture to cut off out there??? Is it me, or does it look like the deformation zone is going to set up right over the metro? Some crazy gravity wave action going on in this storm, evident in the MPX 0.5 deg Z data. Mid-level circulation just south of MSP now, colder air should start to wrap in around the north side not too long from now. Hello snow storm. Ok here goes, my snowfall total for this storm based on the NAM coming around to the ECMWF solution, which it has been somewhat consistent in. This will be based along the I-35 corridor. North of 694 to Northern Anoka county..8-10"
South of 694 to 394 6-8"
south of 494 to Lakeville 3-6"
I would have to say KARE is the biggest loser in the grades. 1-3 of slush was way off, and they were way too slow to pick up on the changing conditions. No question.... KARE is the standout loser on this one. It appears obvious that KARE simply wasn't paying close attention to model & radar trends yesterday. Often, these TV Broadcast Mets get caught up doing other "things" during the day and either don't have time to do their homework and/or don't KARE to do their homework. Is this an excuse? No. However I believe it is important to understand that some of these TV personalities are being pulled in many different directions during their shift. Back in the good old days, larger TV stations could afford to have a 'Weather Producer' on staff. For the most part, those days are gone. It would be interesting to see how many Twin Cities stations still employ a Weather Producer on staff. 4.4" officially at the airport as of 12pm. Clearly KARE is the big loser. I duly expect TMF to slap them down with a well deserved F.
I don't know who handled this storm worse - the forecasters or MNDOT - either way, A DISASTER all the way around. What a joke. Not sure why everyone is so upset about Kare 11, but large parts of the metro, especially south and southwest, only had about 2 inches, so 1-3 range isn't that bad. The airport only had 4.5... so looking at it the other way, with the top end of the other forecasts ranging from 6-10 inches, what's worse? ?, OVERFORECASTING by 1.5 to 5.5 inches, or being under by 1 inch? Of course it highly depends on where in the metro you are. I only had about 2.5 inches in Eden Prairie. And for the record, regardless of 1 inch or 10, 99% of the population is incredibly SICK OF SNOW and SICK OF THE COLD. I have never heard more people upset or frustrated by a weather pattern than I'm hearing this year. So, Winter, Move along already - it is time for you to meet your death. then I would strongly recommend that 99% to move to San Diego and that ridicolously boring 60 degree weather all year around. If you are sick of snow, you should not live in Minnesota. It does snow in Minnesota, sometimes well into April (and even in May for that matter). I believe Jerrid Sebesta is officially the Weather Producer for KARE 11. He replaced Don Muldenhauer [sp]. KARE did move their snow predictions south last night at 10 pm, but not nearly as much as the other outlets. Their conservative approach burned them on this one. Regarding the KARE's accuracy, central Carver County also only received 2-3 icy, slushy inches, maybe near 4 in some places. Pretty close to what they said. They expected the far northern metro (Cambridge, St. Francis, etc) to get 4-6 as of 10 pm, so their final predictions were about 20 miles too far north compared to others, but only off by 1-3 inches in most spots. Not great, but also not bad, considering the bust many forecasters had with the last storm. It sometimes seems like there is more and more snow each year... I've been to Japan in winter and saw really a lot of it, like 30 inches.